Moving to California - Compare International Movers & Save up to 70% ! Using Intlmovers is a quick and easy way for you to obtain quotes for your move to California. It doesn’t cost anything to use, and the quotes that you receive are completely obligation free. You simply have to select where you are moving from and to (with a drop down menu) and complete a short request form. Your request is then sent to up to six international moving companies that can assist you with your move to (or from) California. Just comparing the price at the bottom of any quote is no guarantee that you are getting the best deal. You need to be sure that you have compared the different types of services that are on offer. When you are moving to California, make sure you compare for best value rather than just price. The quote that you receive from the international moving and shipping company is based on the information that you provide to them. Therefore it is really important that you are as accurate as possible with the information you give. Details that are important for them to know include moves to multiple storey homes, availability of stairs or lifts and ground floor access. 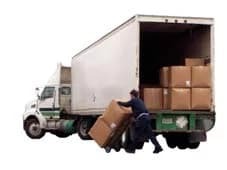 This information is factored in to the overall calculation of the amount of time the move will take, and the total cost of the job for your move to California. When you are planning an international move to California, you will need to ensure you have the correct paperwork. There is a Visa Waiver Program in the USA. There are 36 participating countries that include Australia, New Zealand, Singapore as well as a number of European countries are able to visit the USA for a maximum of 90 days without the need of a visa. Canadian and Mexican passport holders have other applicable rules, depending on their reason for travel to the USA. There are a number of different types of visas for travelling to and staying in the USA. The type that you need to apply for will depend upon your reason for going to the USA. These include examples such as being married to a US citizen or if you are travelling under an employer sponsorship. There are also special visas for students and professional athletes, as well as for artists and performers. As with all forms of international travel, it is important that you check with your local authorities for the exact needs for your personal situation. The major areas of employment in California are trade, transport, utilities and hospitality. Agriculture is also a very important contributor to the Californian economy. Being home to Silicon Valley, there is also a vast amount of opportunity in the IT industry, with many major technology companies having head office or headquarters based out of California. Tourism is a huge industry, with California being home to the movie production center of Hollywood as well as home to a number of world famous theme parks, including Disneyland. The average price of a family home in California is around $750,000. As with all real estate estimates, pricing is always dependent upon where you live and the total space that you have. An average apartment rental can range anywhere between $1200 per month to around $3500 per month. Depending on where you live in California, the tax rate can vary between 7.25 and 8.75%. There is no tax applied to food or prescription drugs. 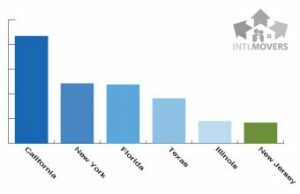 The cost of living in California in comparison to other US states is considered high. Being the third largest state of the USA, the climate of California varies significantly. In the northern areas it ranges from arctic to subarctic climate conditions; whereas it experiences a Mediterranean climate in the coastal and southern areas. These areas experience warm and dry summers with cool and wet winters. The influence of the ocean has a great impact on the Californian weather patterns. The moving companies on Intlmovers are professionals, who often offer specialization in specific services or fields. If you are moving from California you can request free moving quotes from the best international moving companies from California.